Fraser Nelson follows his article in the Spectator here on Cameron the job-maker with a piece in the Telegraph here hailing a jobs miracle involving an avalanche of new jobs that is phenomenal and a game-changer. While the previous was true enough up to a point, this one is a bit more tendentious. What confounded the eggheads was that the number of workers is growing four times faster than the number of working-age people: in other words, Britons have become far more likely than pretty much anyone else to look for –and find – work. Why? It’s hardly the dazzling salaries on offer, since wages are still being outpaced by inflation. Nor is it immigration: that’s still continuing, but the dole queues are shrinking faster. Those shrinking dole queues first. It's taken a while for unemployment to come down, the numbers out of work a year ago much the same as before the election. But since the beginning of 2013 there's been a sharp drop of near 400,000 in a year. 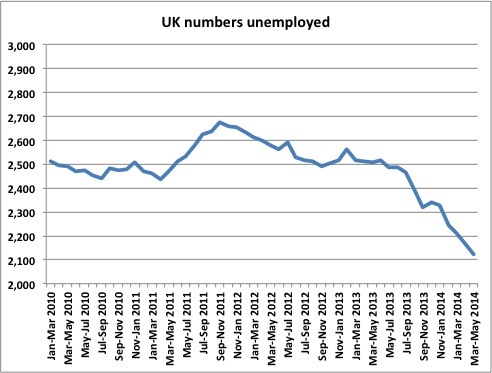 But what happened to employment levels during this precipitous decline in unemployment over the year? 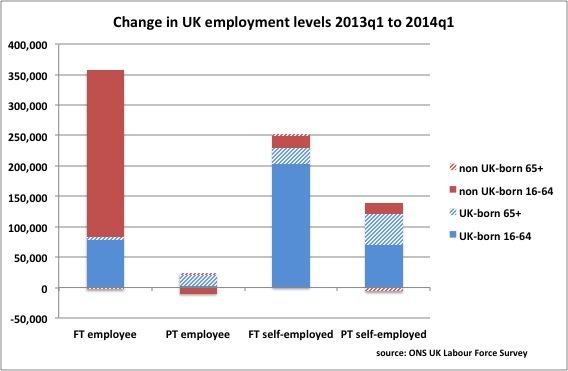 I'm not sure who Fraser counts as Britons, but breaking down the workforce into UK-born and people born abroad, increase in employment levels for the former has resulted very largely from increases in self-employment. For the latter the picture is quite different. The increase for UK-born is slightly greater than for people born abroad, so I won't quibble over whether this shows Britons have become far more likely than pretty much anyone else to look for –and find – work. On the other hand, the difference in the kind of work actually found is quite striking. 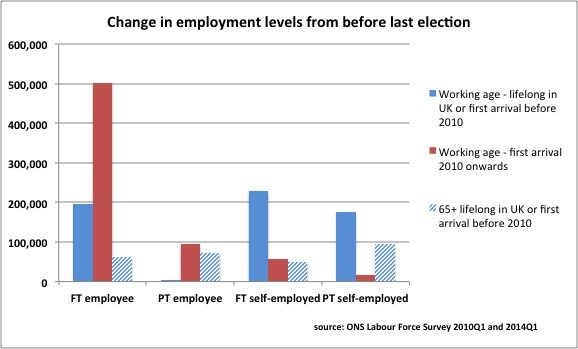 Even when the scale of the employment avalanche became clear, Labour still thought it had spotted a flaw. One of its big thinkers, Lord Adonis, recently declared himself “seriously concerned about the unbalanced nature of growth” because “four fifths of net new jobs in the last four years were in London”. In actual fact, three quarters of them were created outside the capital – and the North East is basking in the status of Britain’s job-creation hot spot. 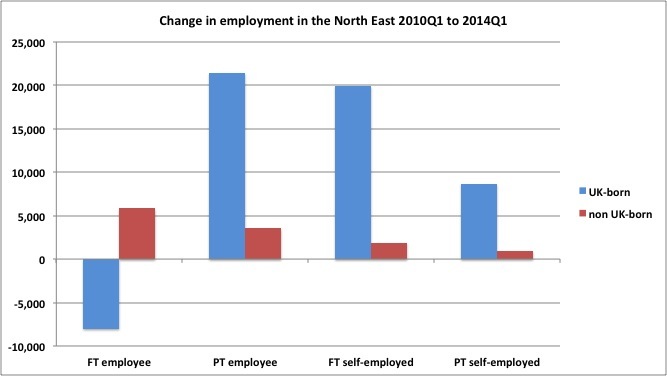 Focussing on that hot spot and looking at what's happened to employment levels in the North East since before the last election, there has actually been a fall in the number of full-time employees (even taking into account the increase in numbers of full-time employees born abroad). It's not so much that growth is not unbalanced, but that there might be more significant imbalances than differences between regions. Of course, some people born abroad have been in the UK for quite a while, but it's interesting to note the extent to which the very newest arrivals - during this government - have contributed to rising working-age employment. Some might find this even more striking. Fraser's tack has changed a little since his Spectator article, and he concedes that some of the growth in employment is more a sign of necessity than opportunity. But he's firm that being driven to find something new to do by welfare reform is no bad thing, and concludes But still – not since Churchill presided over an economy recovering from war have so many Britons found so much work so quickly. That can't actually be right. 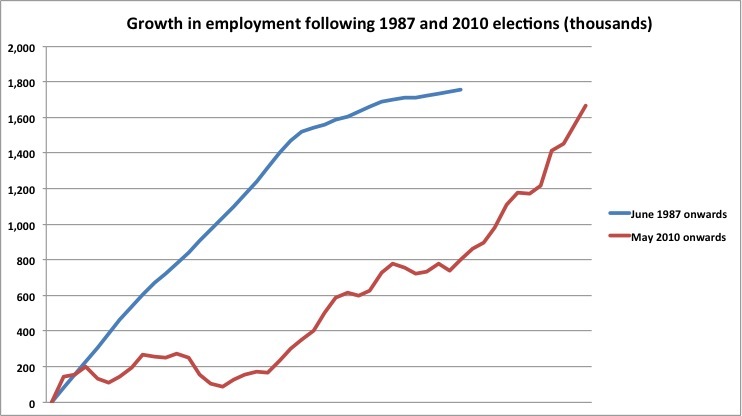 The amount of growth in employment under Cameron since the 2010 election was achieved under Margaret Thatcher after the 1987 election, but she managed it in three years whereas Cameron has taken four years. And of course however Briton is defined, a rather smaller proportion of change 1987-1990 will have resulted from new arrivals than has during 2010-2014. Fraser says we are experiencing the greatest jobs boom in decades. 'Greatest' can refer to both quantity and quality. On quantity it doesn't look as if we are quite there. On quality .... well perhaps best just not mind the quality.